Executive Mentor Services can help you grow your business. One of the most exciting and rewarding experiences for any entrepreneur is to successfully start and operate their own business. But they often don’t know where to start and the realization that they may fail often discourages them from trying. Many entrepreneurs just don’t know how to approach it and end up making terrible mistakes and often lose a lot of their own money as a result. It doesn’t have to be this way. EntreDot has a process that has discrete steps and verifiable checkpoints that help you determine if you are on the right track or not. If you are going to fail, it is good to know it as soon as possible so you can minimize your losses. 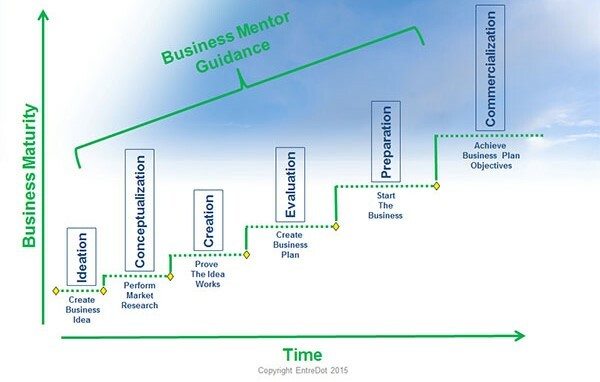 Starting from a raw idea for a business, coupled with guidance from a mentor, our process takes an entrepreneur through a logical stepwise refinement of a business idea all the way to ultimate commercialization of the business. Each step in the process is more complex, more expensive in time and money and will take longer than the previous steps. Proceeding to the next step in the process or trying to perform a step without having done the previous ones greatly increases the chance for failure. Business maturity and development costs increase at each step. The cost of failure is increasingly higher as new steps are attempted. Nobody can guarantee success, but we surely can improve your chances of it. The guidance of a mentor will keep you on track and hold you accountable for the work you do at each step.